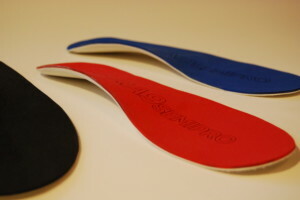 Cobra9 provides customised cycling orthotics specially designed to fit the shape and structure of cycling shoes. Utilising carbon fibre to maximise stiffness whilst minimising bulk, Cobra9s are a premium solution for reducing foot discomfort or numbness whilst cycling, as well as optimising power transfer. The dual density outer casing consists of a firm hard wearing outer layer, and a softer compliant under layer for improved vibration damping, resulting in a comfortable yet light weight orthotic – a Size 43 Cobra9 Pro weighs just 34 grams. 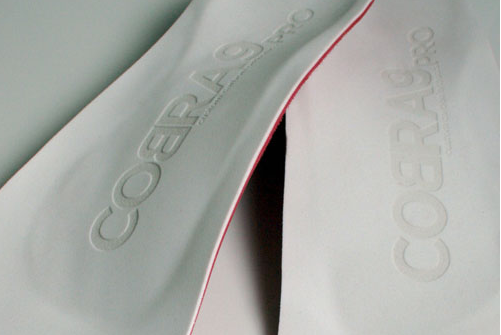 To ensure a true custom fit the Cobra9 Pros require a foam impression cast to be made of your feet, which is then used to ensure that the finished orthotic matches your unique foot shape and biomechanics. 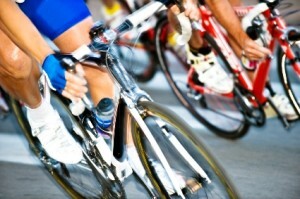 Cycling Physiotherapy centre provides the primary casting service for Melbourne, and only requires a single 30-minute Physiotherapy appointment. The orthotics are then made according to your cast and delivered within two weeks, and Podiatry rebates may be available from your private health insurer. As their name suggests the newly released Cobra9 Semi-Pros are a semi-custom option, available in three arch profile options and four lengths which will fit shoes ranging from Size 39 to 48. The glass fibre inner core can be heat moulded to refine the arch profiling and it is recommended that such adjustments are made with our assistance at the clinic.